Motivated students may participate in the sociology honors program. 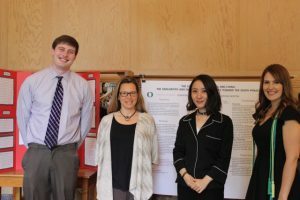 Qualified students work closely with a faculty member and fellow honors students on a year-long research project of their own design. The thesis may be based on existing data or data collected by students. Students who successfully complete the honors program are recognized at a departmental ceremony in May and again during June’s commencement ceremony. The honors distinction is noted on the student’s official transcript and diploma. 3.40+ GPA or nomination by two faculty members. Applications to the honors program are to be submitted spring term before your senior year. The application is due no later than May 8th, 2019. Alternatively, paper copies are available in the Sociology Department office (736 PLC). Two graded credits of SOC 407 Honors Thesis Preparation (SOC 407 in the fall is designed for students to work closely with a professor to refine research questions and design. Students submit a thesis at the end of the term). One to three P/N credits of SOC 403 Honors Thesis. Two graded credits of SOC 407 Honors Thesis Preparation (Students work with professor and proceed with data collection and analysis). One to three P/N credits of SOC 403 Honors Thesis. The SOC 403 credits for fall and winter together equal four credits. Four graded credits of SOC 403 Honors Thesis (Students submit thesis). The honors program in sociology is not affiliated with the Honors College. If you need more information or have questions please contact Professor CJ Pascoe at: cjpascoe@uoregon.edu, 541-346-1384.